Imagine you’re suddenly ripped from your body and placed in a new one. Maybe it’s taller or heavier than what you’re used to. Maybe it’s more graceful…or more awkward. It would take a bit of getting used to, wouldn’t it? That’s what it’s like for people who are adjusting to life in a wheelchair, especially those who ended up there following an accident. Others may have gradually lost mobility over many years. 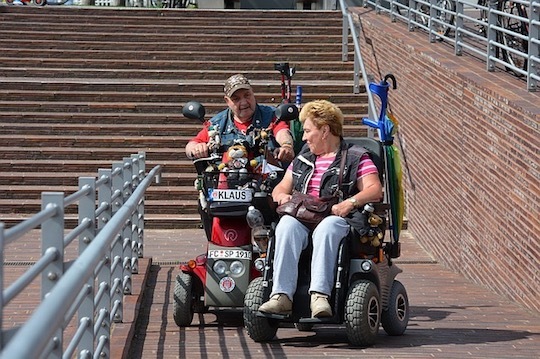 Helping a loved one adjust to life in a wheelchair can be tough. The first major challenge is helping them get used to a body that doesn’t work the way they expect it to. Then they need to learn how to use the wheelchair and other aids to maintain their independence. It’s complicated for everyone. It’s overwhelming for both the person using the wheelchair and the people trying to help them adjust. 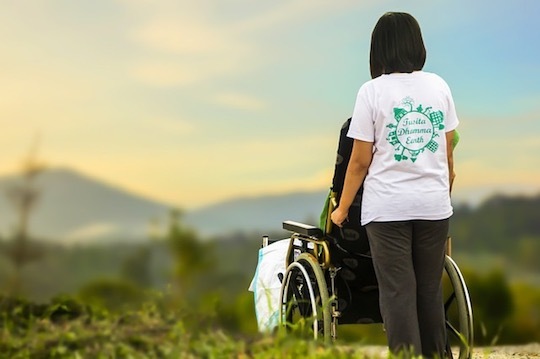 Here are some of the obstacles you’ll face as you take this journey adjusting to life in a wheelchair with your spouse, child, parent or friend. The person in the wheelchair has suffered multiple losses. They’ve lost the body they were accustomed to, the mobility and independence they had, and their self-image. They may most likely be grieving, experiencing denial, anger, and despair. Others struggle with feelings of embarrassment or shame. They become fearful of going out in public, wondering what people will think of them. Many become overwhelmed with the scariness of their new situation. They often feel powerless and afraid of all the unknowns they face in dealing with their injury or illness. This fear can warp their ability to look to the future with any sort of hope. You’ll need to come alongside and encourage them to talk about how they feel and help them work through their emotions. One way to do this is to have them verbalize what they feel. existed stating, “I have a disability” can help them get to face what they are dealing with head on and to get a conversation started. Once you start talking, you can discuss how having a disability does not mean incompetent, worthless, or unable. All it means is they have a few more challenges to face. They will adjust, they will learn to use their tools better, they’ll develop a new routine, a new normal. Help them keep their focus on what they’ve lost. Instead, concentrate on what they have and the possibilities ahead of them. Humor is a tool that gives you power over how you feel. The more you and your loved one can laugh about your situation, the more comfortable you’ll both be. It will take time to adjust, learn, to adapt. 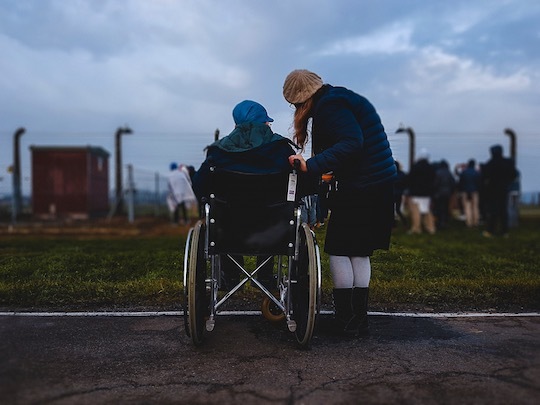 Reminding each other of that and learning to deal with frustration will go along well to helping your loved one successfully adapt to life in a wheelchair. We all live in a world of expectations. We expect that it will take so much time to take a shower and get dressed. Or to move from the house to the car. Or from the car to the store. And when our expectations aren’t met, we’re frustrated. For people getting used to a wheelchair, all their past expectations are all thrown to the wayside. 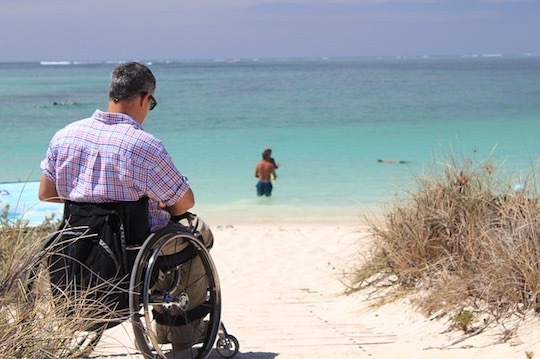 Frustration results, as the person, drowns in the thought that “it shouldn’t be this way.” This frustration can be overwhelming to a new wheelchair user. Help your loved one create new expectations for how long it will take to do things. This means you’ll have to help them be patient with how much time they spend on what used to be simple tasks. You’ll also have to help them decide how much they are going to try to do each day. Setting some realistic goals will help lessen the frustration. The important thing is to not settle for easy goals but to push to accomplish a little more every day. One of the biggest challenges facing someone in a wheelchair is maintaining and improving their level of independence. The more independence they can gain or maintain, the easier it will be for them to stay positive about life. Let the person try to do whatever they are attempting to do. They need to constantly push themselves. Don’t swoop in and take over. Only help when they ask, and only do what they ask you to do. Keep working to discover the best tools and other adaptive devices that your loved one can use to maximize their independence. 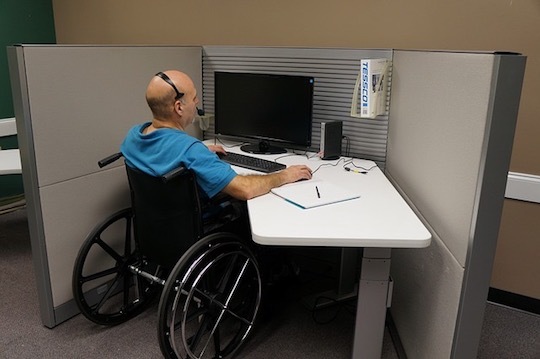 Whether you are looking at a specially fitted van so they can drive or modifications to a computer so they can surf the net on their own, adaptive devices will give them more independence and help overcome any sense of helplessness. 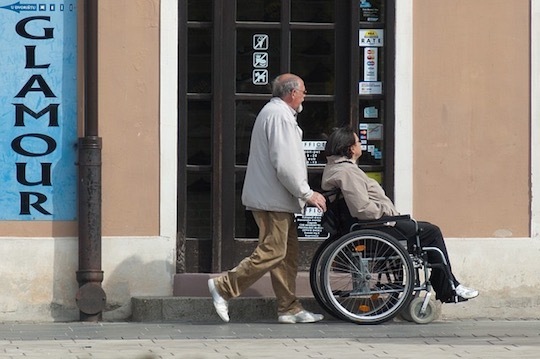 One of the biggest adjustments for wheelchair users is not being able to do simple life activities, like going to the toilet or brushing their teeth without assistance. This feeling of helplessness and losing any bit of privacy can be demoralizing, depressing and defeating. The most important thing to keep in mind is to maximize how much the person can do by themselves. If that means all they can do is choose their clothes, great. If that means they can bathe and wash their own hair and just need help getting from the shower back to their chair, super. Helping with intimate self-care tasks can feel awkward, especially if the person is a friend and not a close family member. But if you’re called on to help shift the person from the wheelchair to the toilet, for example, then offer your assistance. Stay as matter-of-fact as possible and let the person you are assisting directly the process. Most people don’t build their homes to accommodate wheelchairs. So most existed have counters that are too high or doorways that are too narrow. Or the shower might have a step or two that leads to it. All of these issues mean the wheelchair user might not have free access to all parts of his home. Modifying the bathroom, widening doors and adding a ramp are some of the changes that will most likely be required. But depending on the person’s level of ability, other changes might be needed. Work with the person to think about every area of the house. Will the person be doing any cooking? Then you’ll need to think through where cooking tools are stored and the height of the counters. These changes can be expensive. You can help do the research to find out what financial assistance is available. Often people start treating their loved ones in wheelchairs differently than they did before. Yes, you’ve all been through a major life change. But relationship changes only emphasize what the person has lost and how much has changed. Especially when a loved one has been in a traumatic accident, family and friends are afraid of hurting them. So they act as if the person in the wheelchair will break and refrain from hugging them or even touching them. This just increases the wheelchair user’s sense of isolation and loss. If you used to hug your friend, don’t stop. Keep the level of physical contact the same as it was before. This way you reinforce that your feelings for the person haven’t changed and the connection you had still existed. You are still Dad or sister or husband or friend. Your loved one needs their father or sister or husband or friend to be the same as they were. This means, for example, if you as a parent used to bug your kid about picking up after himself, and he still could do this, then by all means, keep bugging him. That way he knows you’re still his mother and you care about him and the relationship is the same. He knows you’re not pitying him. Instead, you are treating him as a responsible member of the family. As much as possible, do the same activities you used to do together. If you and your friend had a favorite place to eat lunch, then make sure you go there. Even if you’re not sure about accessibility, give it a try, ask for help. It’s what you used to do and enjoy, so why change that if you don’t have to? 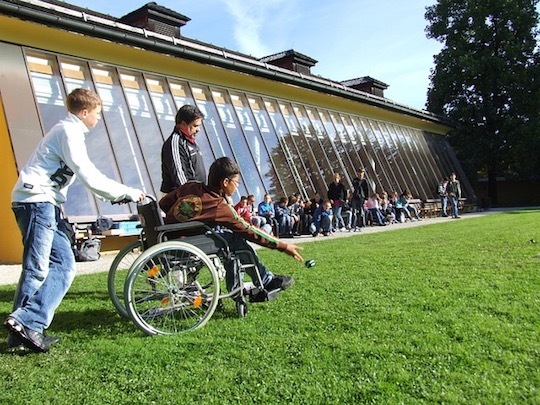 Many people in wheelchairs withdraw from life. That isolation isn’t good and only reinforces the sense that their lives are now limited, dull and pointless. If your loved one enjoyed going to baseball games, then make sure he gets to some. Same with the movies. Or the mall. Help them figure out how to make it work. Some former activities might not be possible anymore. So find some alternatives. Don’t be afraid to try new sports or games together. 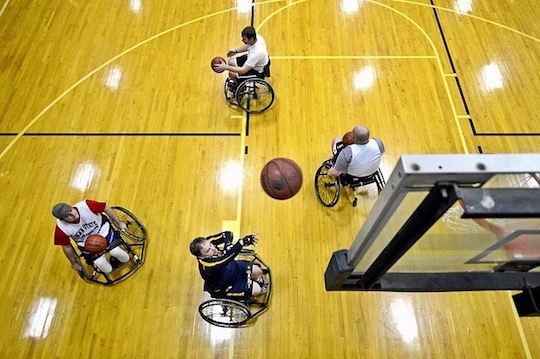 Many popular sports have been modified for wheelchair users. Don’t leave vacations out of the picture. Here you’ll want to do some research and planning. But if your loved one longs to go to the beach, figure out how to make it happen. Or if she dreams of seeing Rome, you can make that happen, too. Living life from a wheelchair means there are many other health issues involved. Which means that medical bills and expenses could start adding up. There may be a break in their ability to work, or they may not be able to work for a long time, if ever. So financial issues could become a source of anxiety. Find out what your insurance will pay for. Learn about what benefits you are eligible for and use them. For example, there are funds available to help people with paraplegia or quadriplegia attend college. Explore other ways to obtain the assistive devices and tools you need. Many wheelchair users have turned to bicycle shops for some parts, as these are much cheaper than what durable medical equipment providers charge. Adapting to using a wheelchair can be a frustrating journey for both the person in the wheelchair and those close to them. But over time, many have pushed through and found ways to adapt and to thrive. With patience, perseverance and a hopeful perspective, you and the wheelchair user you love will be able to find that path that leads to a full and rewarding life.